Link: The Faces of Evil, Zelda: The Wand of Gamelon and Zelda’s Adventure are all The Legend of Zelda games released on the Philips CD-i in the mid 1990’s. Never heard of these titles? Unsurprising, since Nintendo had little to nothing to do with the development of any of them. Not only were the games mostly panned by many critics, but the system itself, the Philips CD-i, was also a failure and did not stay on the market long. As the games have begun to resurface over the last few years, they have not only been panned but widely criticized as among the worst games ever, with few exceptions. Many fans refer to them as the worst atrocity to ever hit The Legend of Zelda franchise. Ironically, the games themselves rank as some of the rarest and most expensive to buy, alongside games like Suikoden 2 and Nintendo World Championships. So how did Philips convince Nintendo, a company that protects its IP like the most over-protective mama grizzly, to create its own games using Nintendo characters? Back in the day, after Atari almost brought the gaming industry to complete inhalation, there were only two real systems left: the Sega and Nintendo SNES. In order to match the new Sega Mega-CD, Nintendo made a deal with Sony to come out with the Nintendo PlayStation, or SNES-CD for short. Much like the Sega Mega-CD, the system would feature an attachment to play CD games, allowing games to be much larger and sport better graphics and video. Due to a breakdown in negotiations, Nintendo broke off the deal with Sony, which ironically brought about the creation of the Sony PlayStation. Instead Nintendo made a deal with Philips to make the CD attachment, but because of the poor reception of the Mega-CD this was scrapped entirely. As part of the break off Nintendo still allowed Philips to make a number of games with characters like Mario, Zelda and Link. Philips than created Link: The Faces of Evil, Zelda: The Wand of Gamelon and Zelda’s Adventure, with virtually no knowledge of Zelda games, primarily using only sample art and instruction booklets and no help from Nintendo except to make sure characters looked correct. Philips was less concerned about the games, however, and more with showing off the full range of the CD-i. Link: The Faces of Evil and Zelda: The Wand of Gamelon are both designed after Zelda 2: The Adventure of Link, as side-scrolling adventure games. With minimal budget and roughly a year to make both games, it was a complicated process. Featuring a series of Russian-made cut scenes and high end graphics (for the time), the games received mixed reviews. Fans noted the games as difficult and confusing at times, but enjoyed the advanced graphics and FMV’s, even if the games had little relation to the Nintendo version. There was also minor criticism over the fact that playing as Link or Zelda was nearly identical. While modern gamers tend to condemn Link: The Faces of Evil and Zelda: The Wand of Gamelon without even playing them, there have been some gamers who support them. With limited resources and no help from Nintendo, it is reasonable to agree that the games were good for the time, at least if not compared to the actual Zelda games, which is viewed as unfair. Zelda’s Adventure, a top down adventure game, was designed after a combination of the first Legend of Zelda and A Link to the Past. Also attempting to show off the full limits of the CD-i, the game was planned as a massive adventure. Since the CD-i was not developed as a gaming system though, and had numerous limitations, the game was vastly scaled back. This didn’t help to prevent various issues with framerate and loading times, however. 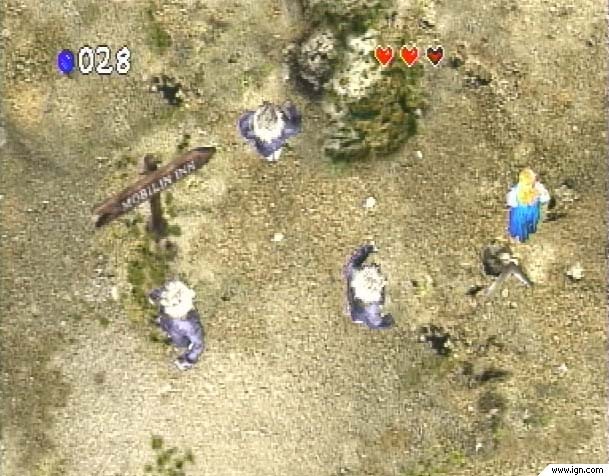 Featuring poorly-rendered graphics from pictures of real places, including LA and Hawaii, the game did not match the graphics quality of Link: The Faces of Evil and Zelda: The Wand of Gamelon. Far more unusual, Zelda’s Adventure features live cut scenes. Not only has the game been ridiculed by modern gamers, but it received mostly negative reviews originally as well. With multiple issues including poor graphics, broken music, unworkable controls and near impossible difficulty Zelda’s Adventure has been called nearly unplayable. While Link: The Faces of Evil, Zelda: The Wand of Gamelon and Zelda’s Adventure are bad by most standards much of the ridicule they receive stems from a comparison to the original Zelda games. Like comparing a game today to a game back on the SNES it doesn’t really make sense. Of course there are going to be major differences; it would almost be more correct to judge them as their own series… one that has thankfully come to an end. While Zelda’s Adventure is bad no matter the time Link: The Faces of Evil and Zelda: The Wand of Gamelon were considered decent at the time. Not good enough to save the CD-i of course. With the PlayStation on one side and Nintendo on the other Philips was lucky to get off the ground. Unfortunately, gamers can only dream about what may have happened if Nintendo and Sony had actually teamed up; besides never having to hear how much better Xbox is again. Writer, gamer, philosopher, historian. I have many years of experience in games, professional and personal, with years of writing. I truly found my love of games with Lunar 2: Eternal Blue and Suikoden.